The world is round; A brief personal history. simplywoodrings from manifestmedia on Vimeo. My company Simply Wood Rings began in 2005. My father was a carpenter, so wood was always a readily available material when I was a child. I would often pick up scraps and carve out swords or small animals. In addition to my fathers work, he greatly enjoyed creating jewelry. Often, I would joyfully accompany him to workshops and watch him create. Since I was young when my father passed, these moments with him are some of my most cherished in life. After a short stint at the Art Institute of Chicago, I attended the Chicago Bauhaus where I learned the fine craft of woodworking. It was there that I explored traditional methods associated with cabinetry. I learned quickly that in the world of woodworking, due to it's long history, tradition is extremely important and unchanging. As a wood worker you are told the world is flat. I took a short leave of absence from creating. I met the love of my life, Juanita, we married and had two beautiful boys, Gabriel and Diego. My family is a source of great pride, joy and support for me. 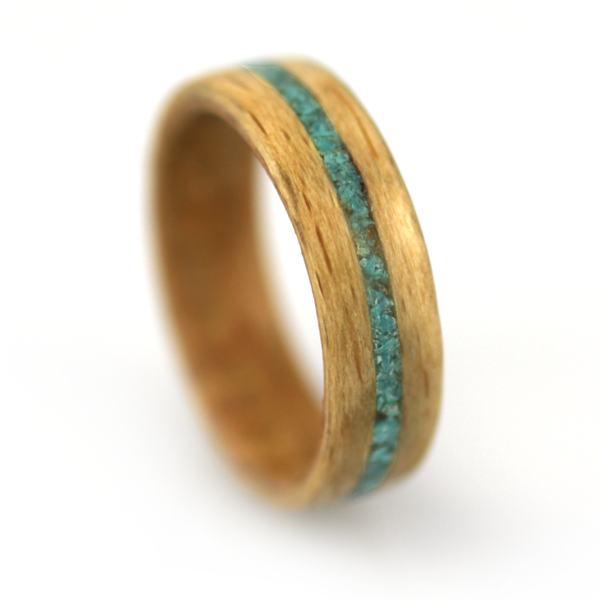 One day my wife asked me if I could create a ring made of wood since she could not wear metal jewelry due to an allergy. I gave it some thought and decided that a ring carved out of wood would not be strong enough as the grain would run across the structure. A few days later my wife came to me again and asked if wood could be bent into a ring. I brushed off her suggestion saying that the thickness of the wood would not allow this. A few days later, for the third time, my wife came to me with a piece of paper. She began rolling the paper and asked if this could be done to create a ring. This, I thought, might just work. The method can be paralleled with the technique of laminate wood. Using the long grain in a circular form creates a strong ring structure. It was my wife who helped me to see that the world was actually round. My company Simply Wood Rings was born from this request and it is how I came to be an art jeweler. 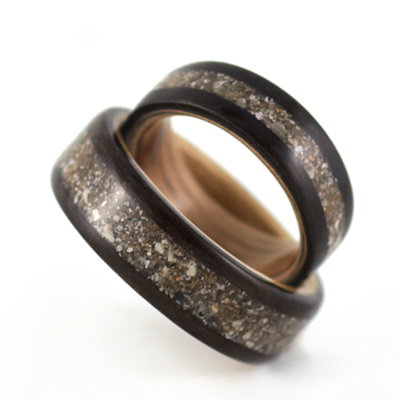 The initial idea behind Simply Wood Rings was to create a shift in a long standing value system. Rather than imbedding the idea of forever into these sacred objects, which symbolize a lifelong connection between two people, these rings create an awareness of the present. They symbolize the love between two people, a love that requires a nurturing consciousness. Beyond even that love, they represent a fragile life on this Earth that is precious, but not everlasting. Wood is engrained with a primal and ancient beauty, a beauty that has been taken for granted. For centuries wood has cleaned the air, provided shelter, warmth, and food. It is an intrinsic part of our history as humans. 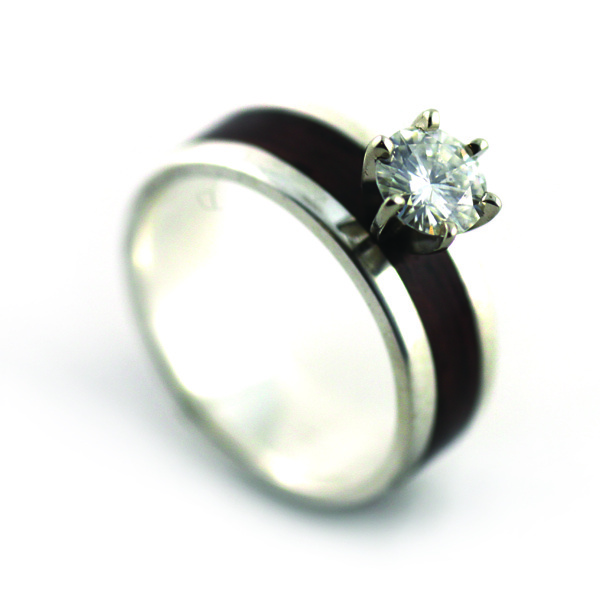 Just as the love between two people requires conscious effort, so does a ring made of wood. In the same way as the material, the life we live on Earth will eventually find it's way back to the ground. The opportunity to create rings that symbolize a lifelong commitment is truly an honor. You may visit the Simply Wood Rings Website for more information.